Shedrite has been a family run business since 1976 and have been making a wide range of sheds from a simple garden shed to the more advanced tailored constructions. We want ensure that all our customers are satisfied when they buy from us. 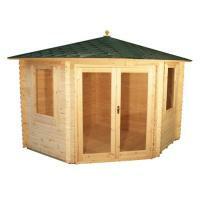 With this in mind, we offer a generous height on every shed we make in order to meet our taller customers’ needs. We use the best quality 12mm redwood timber for the shiplap and tongue-and-groove planking on all our sheds and playhouses. This ensures our customers enjoy many years of trouble-free use. Our redwood is a Scandinavian pine grown in a very cold climate. This means the grain of the timber is neat and tight and makes the timber more dense and durable. To ensure each product is a superior-made structure, we use 32mm x 44mm timber in all our framework construction. Our doors comprise a fully-braced design. 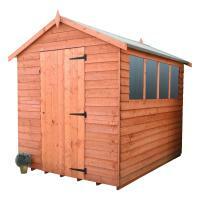 All our sheds carry a 10 Year Guarantee. All our raw materials come from legal and sustainable sources that are either PEFC (Programme for the Endorsement of Forest Certification) or FSC (Forest Stewardship Council) certified. Through our membership of the TTF (Timber Trade Federation) we have maintained full adherence to their Responsible Purchaser Policy and are compliant with the recently introduced EUTR (European Union Timber Regulations). We also hold ISO 14001 certification for our Environmental Management System. 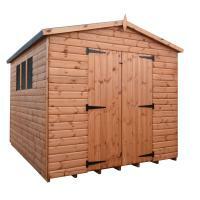 At Shedrite, we have manufactured sheds for over 40 years; supplying trade, commercial and domestic customers alike. As our sheds are manufactured in-house, we maintain strict control over the design, quality of materials and manufacturing process of our products. 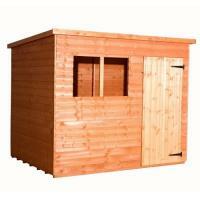 This means our customers can reap the benefits of many hassle-free years of use from our sheds and garden buildings.